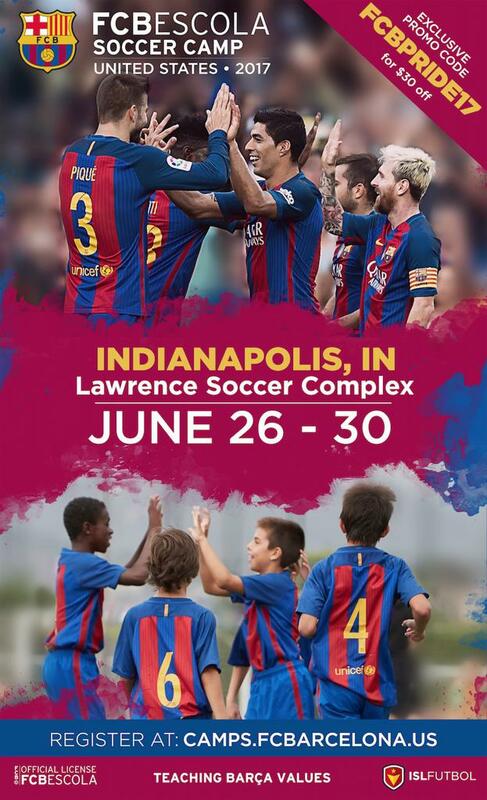 Indianapolis, Indiana – FC Barcelona announces 2017 Youth Development Camp in Indianapolis, IN. FC Barcelona revealed the date and location for the 2017 FCBEscola Soccer Camp held in Indianapolis, IN. The camp will take place at Lawrence Soccer Complex June 26th through 30th, with the support of FC Pride. Boys and girls between the ages of 6 and 16 will have the opportunity to learn the same successful methodologies from which players such as Messi, Iniesta, and Xavi emerged from. Official coaches from FC Barcelona will come exclusively to Indianapolis, IN to conduct all the training sessions, which only allows for limited spaces. The FC Barcelona Youth Academy is the most renowned academy in the world. From a young age, the players are taught the values and techniques of the unique Barça style. A group of selected players from the camp will be invited to train in Barcelona at the FC Barcelona Headquarters. Pride has full access to a number of ISL Futbol Programs that all have one main focus, youth development. FC Pride is already a well renowned youth soccer club, and is the only club to affiliate with ISL Futbol in the state of Indiana. About – ISL Futbol is the official partner of FC Barcelona in the US.